Giacomo Scotti complaint about the "croatization" of Italian literature in Venetian Dalmatia ( http://www.comunitachersina.com/TestoItaliano4_26_03/GiacomoScotti47_3.html ) has prompted me to do a research about the disappearance of the neolatin people in the territories that were part of romanized Illyria .... and I found many interesting and unsuspected things. One of these is the neo-Latin origins of one of the greatest scientific geniuses of the last centuries: Nicola Tesla. We all know that Tesla was born in Lika (today's Croatia) from a Serbian Orthodox family and was considered the only "super-genius" in the world of the defunct Yugoslavia. Even today, the Croats and the Serbs praise him, fighting between them for his ethnicity in a way sometimes harshly. But the fact that his genius shines "alone" in these Yugoslavian lands, has led me to doubt about his origins. In fact, usually a super-genius appears in a society surrounded by a group of other clever individuals like him (as has happened for many centuries in France, Italy, Spain, England, Germany, etc. ...), who are affected by personal good education/instruction together with favorable food supply and consistent socio-economic development. In fact, Galileo-to cite one Italian example- came out not from a community of medieval peasants of Sardinia (with all due respect to them, of course), but was the result of Renaissance Tuscany. From this excerpt it can be deduced that the super-genius Tesla was Croatian only by birth and was Serbian only by language and religion ...... but his ethnic ancestry (we dare to say "by chromosome") was Wallachian, or neo-Latin! Romanian scholars Naicu and Ciutacu, confirm it ( http://www.istro-romanian.net/articles/art040710.html ). 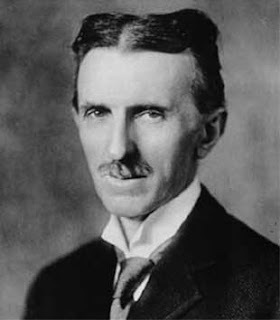 Moreover, his paternal great-great-grandfather had the surname "Draghici" (a typical Wallachian surname, especially in Romania's Banat), but his great-grandfather, who was initially a carpenter, changed it to "Tesla" (in Romanian 'ax' is said 'teslea'): this surname "Draghici" (in Serbian it is said "Draganici") was quite common among the Morlachs of Lika. And we all know that the Morlachs are originally neo-Latin peoples of the Dinaric Alps, who were mainly 'croatized' after the tenth century (read for further details my "I neolatini delle Alpi Dinariche" written a few months ago: http://brunodam.blog.kataweb.it/2012/06/ ). Nicola Tesla was "Vlah" (as Slavs call these neolation populations) from his father's family but even from his mother's family! Indeed the mother of Nicola Tesla was called Mandici and her family was originally from the area of Durmitor (Vlach name meaning "dormitory") in northern Montenegro/western Serbia. This lady Mandici (with a clear romance surname!) is now called "Mandic" (typical Slovenisation, sic!) on almost all the books on Tesla ...... But the most interesting thing is that the mother of Tesla had a prodigious memory and an intelligence very bright, according to all the biographers ( http://books.google.com/books?id=-cHJQL8qCEMC&printsec=frontcover&dq=Prodigal+Genius:+The+Life+of+Nikola+Tesla&hl=en), although she was illiterate as almost all the women in this region and in these decades. In other words, the super-genius Nicola Tesla seems to have inherited the intelligence of his mother in a superlative way: he was a member of the Mandici, a Vlach family that traded in the late Renaissance with the merchants of the Republic of Venice (and maybe was related to Venetians with some marriage) and that lived in a region still today called "Stari Vlah" (literally in Serbian-Croatian that means "historical Wallachia") bordering the "Romanija" of Bosnia ( http://www.farsarotul.org/nl16_1.htm ). Currently in Romanija there it is even a village named Mandici, not far away from Sarajevo. And we cannot forget that a Romanian academic, Professor Moraru, says in one of his publications specifically that the "Province Lica was locuita compact de Istrian-românii morlaci, Inca din sec. XV-XVI "(the province of Lika was compactly inhabited by istroromanians/morlachs, from the XV/XVI centuries) and that Nicola Tesla "a fost istroroman" (was istroromanian): Lika in the maps of the late Renaissance was identified with the "Morlacchia Major" - http://it.wikipedia.org/wiki/File:Morlachia.jpg , and was populated mainly by morlachs who later moved to the island of Krk/Veglia and in Istria (where they received the name istroromanians). Moreover, the young Nicola Tesla did not know the ethnical existence of the istroromanians (studied in detail only at the end of the nineteenth century - http://www.istro-romanian.com/documents/1899-1900_vassilich_archeo-triestino.pdf, as happened with the Dalmatian Italians "discovered" academically by Bartoli only in 1906) and so he identifyed himself , when emigrated into the United States in 1884, with the only ethnicity of his lands known by everybody in those years, the Serbo-Croatian: when Romanian scholars contacted him in the early twentieth century and explained to him that he was of istroromanian roots, he showed amazement ..... and chose -in doubt- not to comment on that matter! In other words: NICOLA TESLA HAS NEVER DENIED HIS POSSIBLE ISTROROMANIAN ORIGINS. In his many writings (and declarations) he has always said that he considered himself to be serbo-croatian, but he never mentioned his istroromanian roots while denying these origins. And additionally, according to Moraru, Nicola Tesla could speak in istroromanian since attending elementary school .... which leaves us with some question marks: was he "conditioned" or "forced" not to admit his wallachian/istroromanian origins? Finally it should be noted that Nicola Tesla was born in a village about ten kilometers from the coast of the "Morlacca Canal" in the Adriatic sea, and the area was inhabited by Dalmatian Italians in the centuries immediately after the fall of the Roman Empire (until the thirteenth century one of the main towns of Lika was called "Rmanj", and even today there is a small monastery there). Not only that, but for several decades, the area also belonged to the Republic of Venice: Karlobag/Carlopago (the Roman Vegium, in the area of Senia/Segna where many Roman colonists had settled in the time of Augustus - http://books.google.co.uk/books?id=W6s9AAAAIAAJ&pg=PA200&lpg=PA200&dq=senia+in+roman+dalmatia&source=bl&ots=llYBiD0QYT&sig=BsssqrudX6UYCRLp_4exPyBwA24&hl=en&sa=X&ei=6sIRUduLN4iB0QHOnIDIDQ&ved=0CGoQ6AEwCQ#v=onepage&q=senia%20in%20roman%20dalmatia&f=false) is located only 20 km from where Tesla was born and was a fortified center of Venice where some venetian families settled during the centuries of venetian Dalmatia ( http://books.google.it/books?id=BZ4AAAAAcAAJ&pg=PA123&dq=storia+della+lika+in+croazia&hl=it&source=gbs_selected_pages&cad=3#v=onepage&q=storia%20della%20lika%20in%20croazia&f=false ). Moreover, the great-grandfather of Tesla could have taken his surname from the Roman town "Tesleum" (current Kosinj - https://docs.google.com/viewer?a=v&q ..., page 22), that existed until the Middle ages just 5 km north of Smiljan, the village where was born Nicola. The area around Tesleum was totally romanized when the Croats arrived there in the late VIII century and the archeologists found only a few slav tombs there (meaning that the area remained mainly populated by the autochtonous romanized dalmatian/illyrians at least until the XI century). So, from the previous considerations we can say that Tesla had definitely some Italian blood in his veins, not only the wallachian/morlach one of his ancestors, and his super-genius could be directly connected (by "heredity" at the chromosomal level) with one of the many scientific geniuses appeared in the Italian peninsula, from Syracusan Archimedes to Roman Fermi. Indeed he is the only super-genius between serbocroats (no other in Croatia and Serbia is or was like him) and this simple reality confirms indirectly that his origins are not slav, but Italian-wallachian (furthermore, he was born in an area bordering the so called "Italian Dalmatia", and Lika was claimed even by Italian irredentists after WWI). In fact, his "intelligence" and genius were evidently the same that appeared among many Italian superbrains in the last centuries: Nicola Tesla was a neo-Latin genius. Please do not invent more lies about Nikola Tesla. His name was NIKOLA TESLA, not Nicolae or Nicola Tesla! I know it's hard to accept, but you'll get used to it! Croats, Romanian, Albanian, Macedonian,...they all have tried to steal him, of course for strategic and political reasons. Everybody needs good PR agent for their country, but this is a disrespect to the Tesla! Read what Tesla himself wrote about his origin. No one said Tesla was Romania, what the article says is that Tesla ancestry might be valah. No one says Tesla was not Serbia, or born in Serbia etc. No one takes away his cultural identity . He is Serbian everyone knows that. But can you say 100% that his ancestry did not come from Valahia ? Well, Barni. With all respect, but the evidences explained in the article are clear and complete. He was surely of neolatin roots. Tesla wrote that his origins were from an area full of Serb speaking people, of course, but NICOLA TESLA HAS NEVER DENIED HIS POSSIBLE ISTROROMANIAN ORIGINS. Regards, Bjr. And allow me to add and repeat, Barni, that Tesla was a Serb born in an croat area that was historically roman Dalmatia and where many neolatin "vlachs" -called later even Vlasi or Morlachs- lived as autochtonous population since the MiddleAges. The serbian Tesla was born in a region called Lika where most of the original neolatin population become serb since Renaissance times: that 's why he spoke an obscure dialect called istrorumanian! His ethnicity was clearly mostly "vlach".Tesla reminds me a bit of Napoleon, a french born in Corsica with Italian ethnicity: in France they "kill" you if you call him italian! Indeed, "tesla" is a romanian word (and name) for a carpenter tool which pull up the nails from wooden boards. No serbian, nor croat or anything else people don't have﻿ the translation of this word(name). Your historian did make just one attempt, but useless. He earned five minutes of attention for some Roamnians and that's all. Listen everybody, Tesla is a Romanian just like John Smith is American and not Mexican, OK? Can John Smith be of Chinese nationality even if he was born in China? He will be a Chinese citizen but not of Chinese nationality. Well, Nicola Tesla is the John Smith of Romania, OK, that's a F*****G 100% Romanian name! Deal with it! Hehehe just a joke, Tesla was Tesalian from Thessaly, Greece, lol. In ded,he was Vlach. Romanian. but at that time religion was more important than ethnicity. All Orthodox people are related to each other in some kind. Do you know that when Ottoman Empire concurred the Balkans, starting from east and south part, many Orthodox Albanians of north side withdrew more north in todays Serbia, Bosnia and Croatia, to save their religion? Do you know that they preferred to return in their previous Illyrian territories? But, they were assimilated by language and they become Slavs (the same happened with the catholic Albanians that escape in Italy and other orthodoxs of the south in Greece). + the same process happened with the Illyrians before, now with the Albanians also. By DNA in Balkans the majority of people are the same, but by culture only few can survive in their old or original Albanian (Illyrian) culture. The reasons why this is happening, you should research and find by yourself, because here is not the place where we can give too many historical informations about this big and wide issue. Barni, for the last time I have allowed your comments. With all respect, allow me to remember you -again!- that the evidences explained in the article are clear and complete. He was SURELY of neolatin roots. Tesla wrote that his origins were from an area full of Serb speaking people, of course, but NICOLA TESLA HAS NEVER DENIED HIS POSSIBLE ISTROROMANIAN ORIGINS. Probably he was not even aware that "existed" (or has existed since the Middle Ages) an ethnic group with Istroromanian (or neolatin) identity in his Lika region, Bjr.